These artists are captivated by the man-made environment – scaled down. Published on Tuesday, July 25, 2017. This article appears in the June/July 2017 issue of American Craft Magazine. Matthew Albanese diorama based on photographs of Katrina, Sandy, and other violent storms. 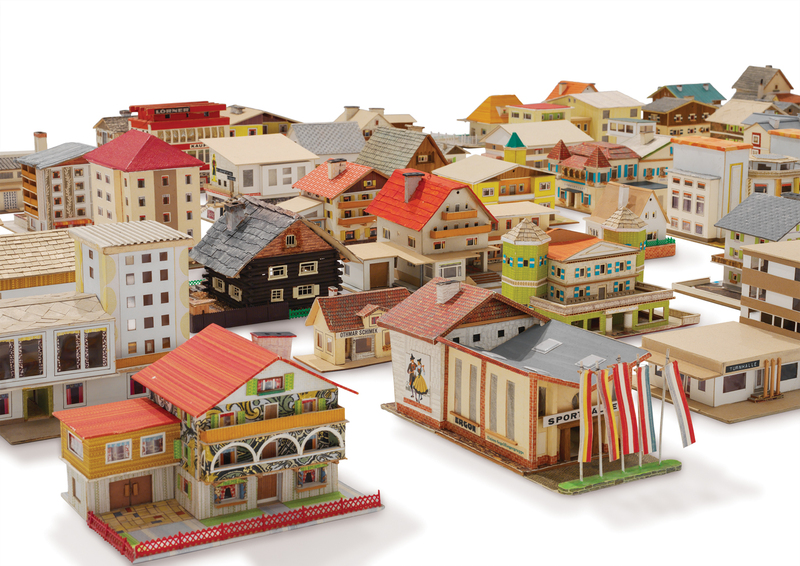 In 1993, Austrian artist Oliver Croy was rummaging through a Berlin junk shop when he happened onto a curious collection of almost 400 building models – houses, storefronts, churches. 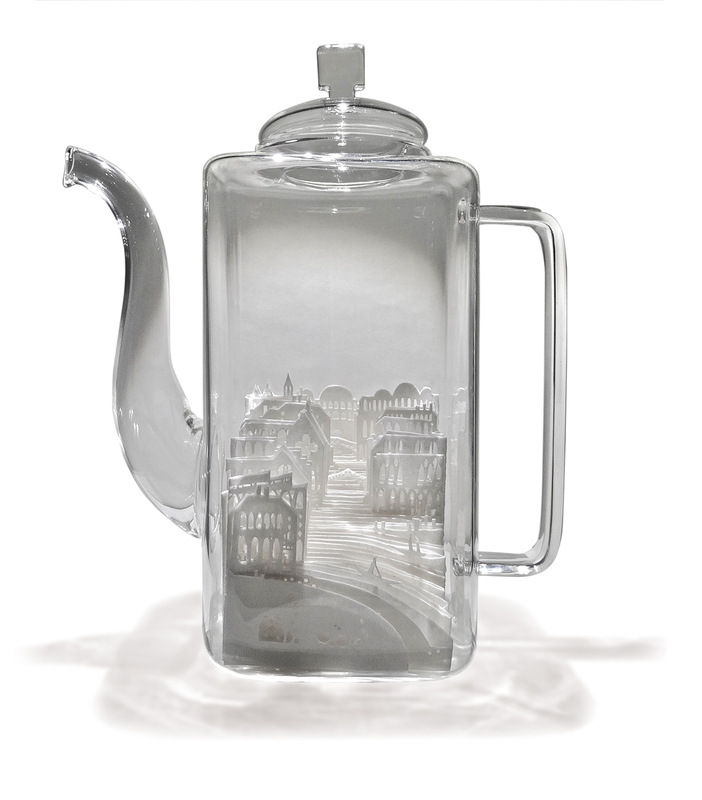 The models, it turns out, were meticulously crafted in the 1950s and ’60s by a Viennese insurance clerk, Peter Fritz. Little is known of Fritz’s motivations, but the tidy collection became the centerpiece of exhibitions in recent years at the New Museum and the Venice Art Biennale. Kami, the word for “god,” “spirit,” and “divinity” in Japanese, is also the word for “paper,” Ayumi Shibata points out. 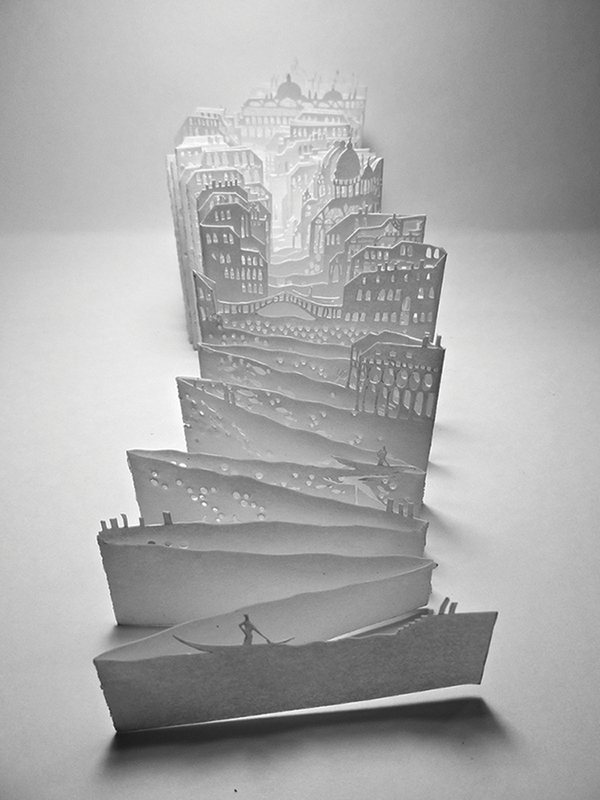 The Paris artist uses traditional Japanese papercutting techniques to represent fantastical skylines, as in Canal and In the Jar (City of Water). Because white paper is sacred in the Shinto religion, each sculpture is like a prayer – that people will live in harmony with the natural world. When New Jersey artist Matthew Albanese set about making this diorama, he was recalling photographs he’d seen of Katrina, Sandy, and other violent storms. “My eye naturally scanned through the detritus to find poignant signs of humanity,” he says – hence the tiny red chair he planted in the pile of wood at left. A cinderblock in the foreground speaks to the severity of the storm, while a floor lamp in the house (which started life as a dollhouse) remains miraculously undisturbed. Itinerant photographer Kurt Moses spends much of each year capturing images of the national parks. But every so often on the road, he and his wife, Edwige, spot a perfect setting for another kind of picture. 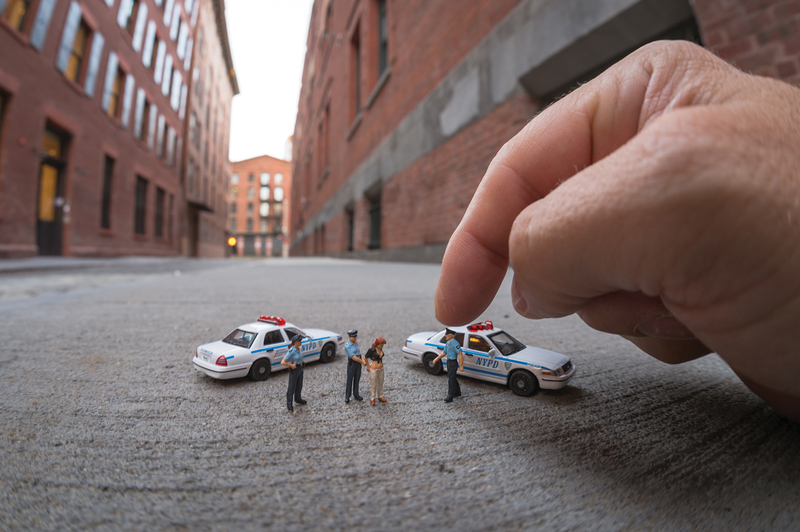 The resulting images, which use miniature figures, a fish-eye lens, and shallow depth of field to play with scale, comprise their series Un Petit Monde (“A Little World”). This Manhattan scene looks perfectly plausible – until a Brobdingnagian hand encroaches. 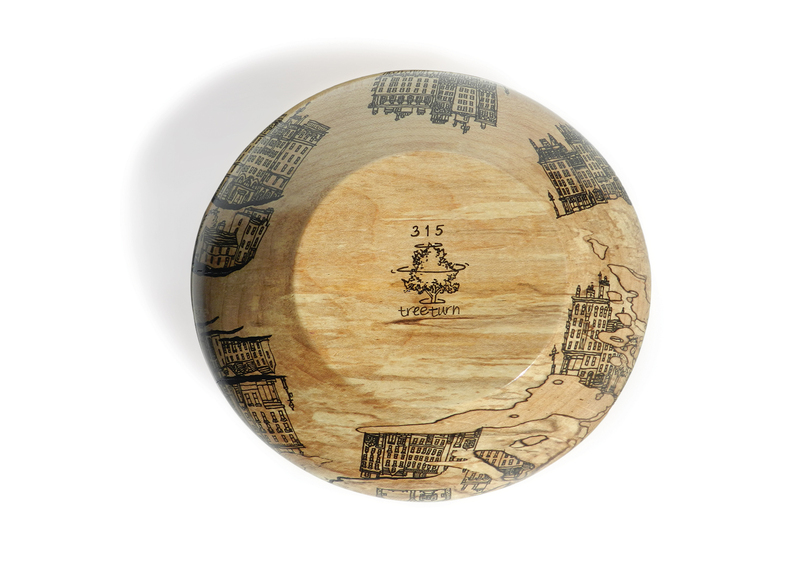 Imperfections in wood are the jumping-off point for these illustrated turned bowls. 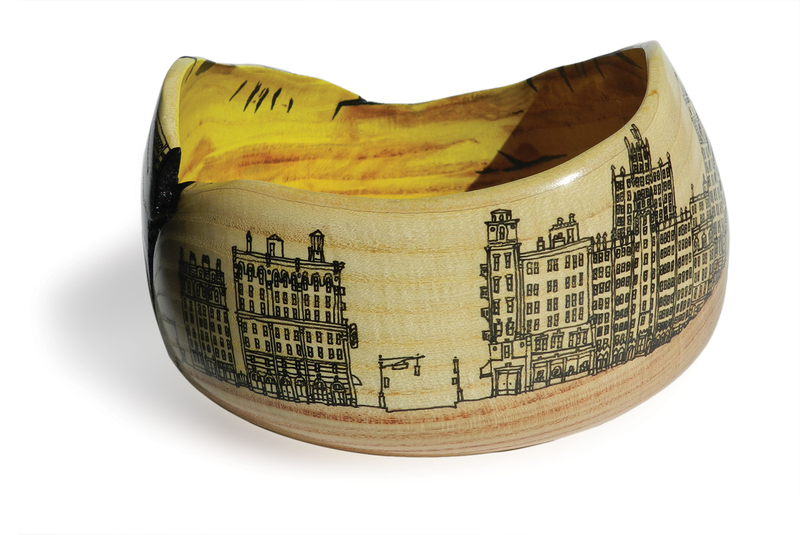 Yelena Synkova, who trained as a furniture maker but found her true métier in woodturning, makes the vessels. Sean Cummings, whose drawings suggest his career as an architect, adds the buildings. Their combined efforts reflect the pair’s fascination with Beacon Hill, Back Bay, and other Boston neighborhoods, where they live and harvest wood from naturally downed trees. Oliver Croy's collection of building models.